I’ve mentioned my brother before. I didn’t mention that he has made it a point of having visited every major league ballpark for nearly 30 years. This year, he added the two newest ballparks to his collection, and he’s graciously submitted his review of them to THT. Enjoy! Since one of my hobbies is visiting every major league baseball stadium, this is a great time of the year. I first completed my “collection” in 1975 or so, and I’ve kept up to date ever since. 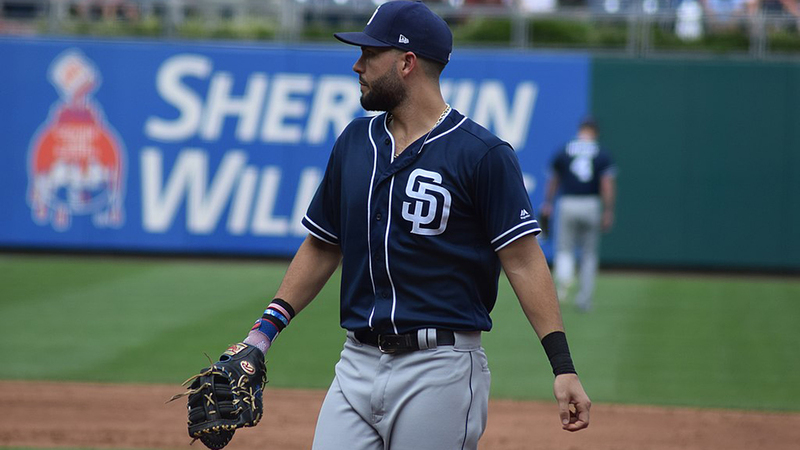 I just returned from games at PetCo Park in San Diego and Citizens Bank Park in Philadelphia, and I thought you might be interested in my evaluations of the new stadiums. PetCo is a true gem. Set in the Gaslamp district just two blocks from San Diego bay, PetCo is so close to the surrounding downtown hotels, restaurants, and bars that it even has a bridge from the second deck to the lobby of the Omni Hotel next door. The stadium itself is small (low 40,000s in capacity) but unique. The outside is sheathed in a glowing tan rock facade that is quite different from anything I’ve seen. In addition, the structure of the upper decks at PetCo isn’t continuous — it’s almost like three different stadiums broken up by fairly tall (and wide) light towers behind first and third. The stands actually come to a halt for these towers, and it’s impossible for a fan to walk from one section to another. I’ve never seen anything like it. Finally, and most endearingly, the stadium was built around a century-old brick structure, Western Metal Supply. It’s a great idea. You can walk from new to old without a hitch, a portion of the old building is in fair territory, and each floor of the factory has been converted to a luxury suite, complete with an overhanging deck. My guess is that the Western Metal Supply building will become Petco’s signature feature, and deservedly so. The field itself is free from gimmicks except for a fun “porch” in right field that juts out just left of the foul pole and then scoots abruptly back not long after. You can expect a ton of triples (off the odd angles) and some extra homers to dead right, but, except for that, the stadium looks to be a pitchers’ park. Not only are the power alleys fairly deep, but the sea air seems to hold the ball up. The amenities, including the food, in the stadium are good but not great, but all the other basics are fantastic. The sight lines are superb (though some seats aren’t angled quite right), and the two upper decks are very close to the field and very steep. As a result, everyone in the ballpark (including those in the upper decks) feels close to the game. Given that, and given that the grass is real and the scoreboards are numerous, the overall feel is quite similar to Coors or the Jake. It’s a blast! Nothing is perfect, so it won’t surprise you that PetCo has a couple of weaknesses, at least one of which really can’t be fixed. What you notice first is a shortage of bathrooms. I’ve been to many parks where I’ve seen lines outside of women’s rooms, and I’ve even been to a couple where I’ve seen lines outside of men’s rooms around the 7th inning, so I’m not expecting perfection here. However, Petco is so short of bathrooms (and the bathrooms have so few fixtures) that there seemed to be long lines outside every men’s room during every inning. A second weakness is that it may well be too much of a pitchers’ park. Time and time again, the deep power alleys combined with the moist, heavy sea air to convert extra base hits into flyouts. Whether this will change when the weather heats up is questionable, since the bay is so close. The final and most important drawback to the park is that it doesn’t take advantage of its location. If you’re sitting in the stadium, you really have no idea that you’re right next to a beautiful bay. When you walk to your car, you see craggy Point Loma, the soaring Coronado bridge, the huge aircraft carriers at the naval airbase, and hundreds of sailboats, but in the stadium, you might as well be landlocked. I understand that pointing the stadium at the bay might have caused some sun problems for someone, but it’s still a shame to have had a chance to rival PacBell (uh, SBC) and to have dropped the ball. Even given these drawbacks, however, PetCo is a smashing success. It’s bound to provide a wonderful venue for the Padres long after the excitement of a new stadium is gone. Eight days after I attended opening day in PetCo, I was at the first night game ever in Philadelphia’s Citizens Bank Park, and I was immediately struck by a number of parallels between the two stadiums. They’re quite similar in seating capacity, they avoid glitzy gimmicks, and they’ve got a cozy, “high quality” look to them. After that, however, some interesting differences grab your attention. Citizens Bank Park is just yards away from a demolished Vet, but it’s light years away in terms of quality. The outside of the new stadium is all brick, the insides are painted a Fenway green, and the seats are all deep blue. The seats are comfortable and well-angled, and there’s a metal “Phillies” logo at the end of each row of seats. The result is a rich, textured, five-tiered “old time stadium” that grows on you without getting “old.” It’s clearly a fan’s ballpark! Sitting behind home plate, five magnificent attractions are all in view simultaneously. In left is perhaps the best scoreboard in baseball, rising high into the night with a huge script “Phillies” logo on top. Even better, the “diamond vision” portion of the scoreboard is the clearest I’ve ever seen — imagine a digital image four times the size of the Dodger Stadium scoreboard, and you’ll be about right. At times, I was tempted to watch the game on the scoreboard rather than directly … that’s how unbelievable it was! Off in center are the bullpens, situated side by side at different levels, so that they appear to be stacked on top of one another if viewed from home plate. In right center, the stands approach the field in a series of sharp angles (one on each of three levels) that narrow to a point, one seat wide, from which the occupant is literally surrounded by baseball … the field in front and the bullpen behind. Behind all this is a food court, aptly named for Richie Ashburn, that outdoes them all (with the possible exception of Atlanta) with wonderful BBQ from “Bull Luzinski” (see Boog Powell), foot-long hot dogs, Philly cheesesteaks, and various entertainments. Finally, off in right field, there’s a huge neon “Liberty Bell” that swings and “bongs” whenever a Phillie hits a homer. All in all, it’s one spectacular outfield. I suppose that’s it’s picky to point out that the stadium was opened before it was complete, so that the scoreboard wasn’t fully ready and the floors had a distinctly unfinished and scruffy look to them. And it’s obviously unfair to quote that architectural reviewer who derided the park for looking as if it were in a suburban mall. Considering that Citizens Bank Park is in a huge parking lot in South Philly, a suburban mall might actually be a good thing! These quibbles aside, I do have two criticisms of the ballpark. First, the field level has too many seats and the slope of the aisles is too shallow; this results in some difficult sight lines and frequent “Siddown ya jerk” calls from behind. In addition, the extra seats mean that all the upper decks are too far from the field. Second, as spunky as the outfield is, the regular stands and the field itself are almost completely lacking in individuality. I understand that we go to a stadium to watch the game, and I hate those gimmicks in Enron/MinuteMaid, but at least one quirk would have made things a bit more fun, no? All that said, what the fans in Philadelphia have is one of the best new ballparks built to date. My guess is that fans will love this park as they loved Shibe … a great and personal place to watch the Phils. Which new stadium, you ask, do I like better? Well, I like the two almost equally, but if I had to pick one (which I obviously do), I’d rank Citizens Bank a hair ahead of PetCo. Both, however, are superb ballparks. In comparison to the rest of the new major league stadiums, they fit nicely between the true brilliance that thrives in San Francisco and Pittsburgh and the acceptable new parks that have been built in Milwaukee and Detroit. That should do it for this year. I note with joy that only six unimproved old ballparks remain in the majors and that the Expos should be playing in a new stadium by next year.